New technology has given hair removal manufacturers the ability to create new laser hair removal products that can be used from the comfort of your own home. But, are they any good? And which product is the best on the market? We took time to compare the following products in the home laser hair removal sector:- Boots Smooth Skin Gold, Remington I-Light Pro IPL, Tria Laser 4X, Philips Lumea, Silk'n SensEpil and No!No! Pro Hair Removal System. Laser vs IPL - What's the Difference? For the purpose of this review, we'll be treating laser hair removal devices and IPL devices as one and the same thing. The underlying technology between the two is slightly different, however there is no current solid scientific evidence to suggest that one performs better than the other. One of the best home laser devices on the market. This device has the most clinical research to back up its effectiveness - studies show that you are highly likely to achieve substantial hair reduction with its usage (no laser device, home or professional, can legitimately guarantee hair removal, yet). The device can be used wirelessly with a battery life of 30 minutes and, while the price is higher than many competitors, the cartridge has a significantly longer lifespan (with 90,000 pulses) than other devices making up for the initial expense. The device is FDA approved and thus comes with adequate safety features (skin tone detector, device locking). The small head size makes it very good for small treatment areas and the device comes with 5 strength settings. This device is a very strong candidate for being best in its category. In fact, if you would like to use your home laser hair removal device on large treatment areas (for example back, or full body) then I'd recommend that you purchase this product over the Tria 4X due to its much larger head size. This is a solid, well built device that is almost $300 cheaper than the Tria 4X​. However, it should be mentioned that the cartridge will need replacing after 1500 flashes (as opposed to 90,000 with the Tria), so the long term running costs eat away at the initial cost saving over the Tria. The refill cartridges will cost you around $40 each. The device comes with a solid set ​of features - it's FDA approved, suitable for large and small treatment areas, has 5 strength settings, is very easy to use and comes with an instructional DVD. Solid, well built device - High quality of manufacture. Easy to use - very simple to use the device. Point and click. Massive saving compared to professional laser hair removal - the product is many times cheaper than having laser hair removal done professionally. Refills Required - The initial unit is cheaper than competitors, however the cartridges on this device need replacing after 1500 flashes. This long term running cost eats away at the initial cost saving. Released to the public in 2014, this is the newest device in the round up review. The product has been received very well with many people reporting strong results. This is a strong, solid product that has many great features. The device has 5 power levels, good safety features (including a skin sensor and pressure switch) and easy to use. The hand set is light, ergonomic and looks trendy. On top of everything the device comes with an instruction DVD with very clear instructions on usage. We have two concerns with this product: 1) The spot size is very small, so it's not great for treating large areas of the body. ​2) We haven't been able to find any clinical data to support the effectiveness of the product. Clear instructions - An instruction manual and DVD are included. Cartridge replacements - After 1500 flashes the cartridge needs to be replaced. Given the small head size, the total treatment area is less than competitors before a replacement is needed. The Philips Lumea is one of the cheapest home hair removal devices available on the market at the moment.It's easy to use, very durable (with over 100,000 flashes before the light needs replacing), includes numerous safety features, and has five adjustable power settings. ​The mid-range time per cm2 rating means that it's good for tackling both small and large treatment areas and can be used on both the body and the face. On the flip side, some tests showed that the energy emitted by the device is too low (2.5 - 6.8 J/cm squared) for permanent hair reduction. Other minor complaints include that the hand set is also quite bulky and that the device can't be used wirelessly. Lack of Available Clinical Evidence - while the manufacturer claims that the product is backed up by scientific data, it is not readily available for viewing. Our less than positive review for this product is down to a few main areas. There are an overwhelming number of people who have had little to no results with the product - this can't be ignored. We have also been unable to find any real clinical data to prove the effectiveness of the product. While the product is by far the cheapest on the market, the replacement parts for the product aren't cheap and make the overall product investment more expensive than the initial low outlay. The device is FDA approved and can be used to treat large and small treatment areas (including the face, with the exception of eyebrows). Replacement Parts - The replacement tips and buffers are fairly expensive. Here's a more technical comparison of the home laser hair removal products. ​Clinical data refers to scientific studies that have been carried out to prove the efficacy of the product. Spot size is the size of the head that emits the laser - this is essentially the size of the treatment area for each pulse / laser emitted. From this data you can see that the Tria 4X is the slowest per cm2 making it quite impractical for treating larger areas (such as the back or full body). On the flip side of the coin, however, the smaller head size means that it's great for areas of the body that require precision. The Silk'n SensEpil has the largest head size and consequently has the fastest time per cm2. It is therefore more suited to larger treatment areas than any of the other devices. It wouldn't, however, be suitable for use on areas where precision is required. The Remington I-light is the only device that doesn't have any scientific data to back up its effectiveness - all other devices have some form of clinical data to prove the efficacy of the product. Some devices, such as the Philips Lumea, have clinical data that is not readily available for viewing. The study for the Philips Lumea was not offered on the manufacturer's site and we couldn't find the study online despite substantial research. Therefore we can't analyse how well the study was carried out. Time per cm² is a useful measurement if you want to use the home laser kit for full body hair removal. Using a machine with a small spot size and slow rep rate can be painstakingly slow for larger body parts. In the chart above, the smaller the bar, the faster the treatment per cm². As you can see, the Silk'n SensEpil is clearly the fastest per cm², however it also has one of the slowest rep rates at 4.1 cm. This makes it useful for larger body parts, but has a head size of 6cm² making it useless for smaller treatment areas. This type of machine contains a high set number of pulses and can last for an extended period of time, however once you use the total amount, then you'll need to replace the entire device at a high cost. ​This type of hair removal device comes with cartridges that have a low number of pulses (often these can do a few full body treatment sessions at max) before you'll need to purchase a replacement cartridge. The cartridges need to replaced a lot more often, but also are cheaper. 90,000 pulses, or 300 battery charging cycles (whichever is less). It is estimated that you need 3,000 flashes for 2 body sessions meaning that the product can give 60 full body sessions. The lamp cartridge life is limited to approximately 750 pulses, which are enough to treat an entire body once, or achieve multiple treatments on the legs only, underarms only, and so on. The initial cost of the device is less than the Tria, but each cartridge can only handle one full body session and is expensive at $37. This device gives life for 120,000 flashes - it is claimed that it can provide full body treatment for 6 years before it needs replacing. The initial cost of this device is very close to the Tria 4X and can provide 30,000 more flashes. The device, in the long run, works out to be very similar with the Tria and Remington and is mid-range in cost. The cartridge can handle 1,500 flashes which lasts for around 2-3 full body treatments. A 2 pack of cartridges retail for around $45. The device comes with 100,000 flashes which is enough for full body treatment for 5 years. Similar to the Tria 4X, except the cost for the device is over $200 lower. Looking at the chart, we can see that the cheapest device is the Philips Lumea comfort. This device is both the cheapest to purchase and, because it has a long lifespan, carries on being the cheapest for the first 24 full body sessions. The SensEpil starts off as the second cheapest, but over time gets more and more expensive relative to the other options due to the expensive cartridges that only last for one full body session. The Remington I Light is the only other home laser hair removal device that​ uses cartridges and is cheaper in the long run than the SensEpil because the cartridges are cheaper and can provide 3 full body sessions each. I've noticed from comments and emails through the site that a lot of the same questions keep popping up again and again. Instead of replying and answering on a 1 by 1 basis, I've decided to document the answers here. Will Home Laser Hair Removal Work For Me? Unfortunately, at the moment, home laser hair removal (and indeed professional laser hair removal) is a bit of a gamble. However, I will say this: If you have light skin and dark hair then the chances of home laser hair removal working for you are really quite good. ​There have been numerous studies performed and most of the participants have achieved in the realms of 50 - 75% hair reduction of the course of the treatment. In some rare cases hair growth has actually been triggered by laser hair removal.​ Before you get too worried, this occurrence is very rare and scientists don't yet understand why this happens. Does Home Laser Hair Removal Work for Darker Skin Tones? ​If you have a skin colour that is darker than four on the Fitzpatrick scale, then there are currently no home laser hair removal machines on the market that will work for you. However, there are certain types of lasers that are used professionally in laser hair removal salons that are designed to work with such dark skin types. Learn more about professional laser hair removal with dark skin. Are Home Laser Hair Removal Products Safe? ​As long as you choose a reputable brand (preferably one that's FDA approved like the Tria 4X or the Silk'n SensEpil) and you operate the device in line with the instructions, then the devices are safe. Home laser hair removal devices operate at a lower fluence than the higher powered lasers used professionally at laser hair removal clinics, so the likelihood of burning is lower.​ Even with the lower fluence, however, if instructions are not followed and the laser is misused then there is a possibility for burns and other side effects to occur. There are also a number of lesser well known and non FDA approved products trying to break into the home laser hair removal space. I strongly recommend that you avoid these products - most don't work and some could be dangerous. 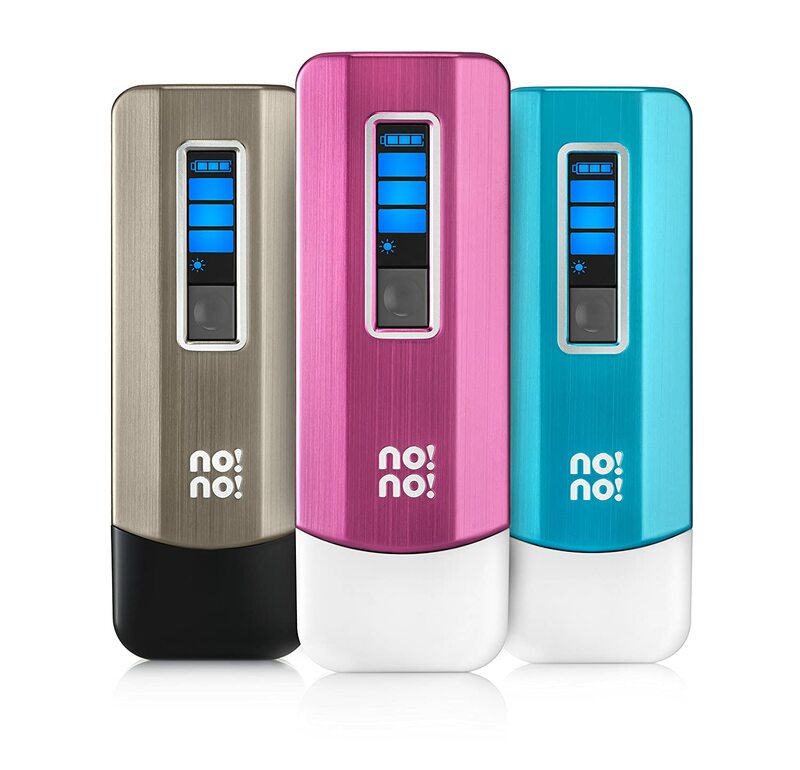 All products home laser hair removal devices on this post (even the ones that haven't been FDA approved) have been proven safe amongst the masses. As you can see from the chart, most people will experience redness (erythema) in the treatment area in the hour following a laser session. In some instances swelling can occur (edema). Other less common side effects include hyperpigmentation (darkening of the skin), crusting, hypopigmentation (lightening of the skin) and blistering. Do have a look at it and hopefully it will answer your questions. If not, post your questions here and I’ll help out. 3) It’s guaranteed to work for everyone. I wouldn’t recommend electrolysis for large body areas, but for the chin it might be a great solution for you. Let us know if you have any more questions about this.